The author of Jesus and Mo hits the rhetorical nail on the head. You can’t insult an idea. 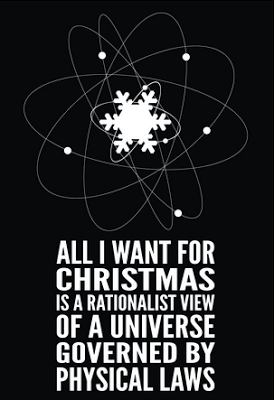 You can get your science-oriented cards from here: Science Gallery Christmas cards. From Kausik Datta at In Sciento Veritas over on SciLogs we have a bit of nerdish humour: The Material Data Safety Sheet for hydrogen hydroxide, or was that dihydrogen monoxide? Happy Holidays! Ho, ho, ho! And a “Ho, ho, ho!” to you and yours. You can buy these sciency cards at Not on the High Street. Puff the Mutant Dragon has an excellent takedown of Vaccines Have Chemicals alarmism: “Do vaccines contain toxic chemicals?” Puff considers mercury, ammonia, formaldehyde, thimerosol, aluminum, and hydrochloric acid. In addition, Puff found a cartoon showing Jenner vaccinating people with cowpox. The results look like a humorous jab at vaccination fears. And yet this was a huge step up from previous inoculation procedures, which used a mild strain of smallpox with only 10% mortality to protect against the wild strains with 30% mortality. Fails so much it wins. JT Eberhard is humanity’s best chance in a zombie apocalypse. Less importantly, he is a campus organizer and high school specialist with the Secular Student Alliance. Once an opera singer, he now resides in Ohio where he occupies his time by helping atheist students to win at activism! In 2008 JT brought the gold medal in cuddling back to the United States and is presently in training for 2012. Eberhard also spent eleven years on the Candy Land pro circuit before retiring in 2010. Hate mail, overt gratitude, religious people trying to convert me, marriage requests, threats and all other non-comment material should be sent to wwjtd21[at]gmail[dot]com.